Internet, is it necessary in crowdsourcing? 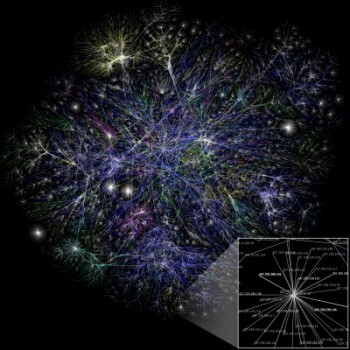 Partial map of the Internet based on information obtained opte.org Site in 2005... 8 years ago! After a well deserved rest after defending my PhD thesis, I’m excited to post in my crowdsourcing blog again and to start a new stage in my research career, returning to study other features of crowdsourcing (with a little less pressure). This new stage is inaugurated with this post, which title may surprise more than one. The fact is that the question in the title has been asked to me by several people: to what extent is necessary Internet to classify an initiative as a crowdsourcing initiative? Can it be considered crowdsourcing to send sms through mobile phones for some sort of initiative? Or even, can it be considered a crowdsourcing initiative one in which people participate without the use of any technology? To be clear, from my point of view, the answer is easy: Yes, the Internet is essential to consider an initiative a crowdsourcing initiative. If not using the Internet, that initiative will be a collective intelligence initiative that will use some other channel (not a technological one), but you can not say it’s crowdsourcing. This claim is based in two facts. On one hand, and as magnificently introduces Jeff Howe in a video that explains what the crowdsourcing is (you can see it below), the Internet provides access to millions of people. In fact, it is one of the main features of crowdsourcing that differentiates it from other initiatives such as Open Innovation: the ability to access a huge group of people. It is true that our circle of contacts is much more limited (sometimes a few hundred people), but, potentially, the Internet can give us access to millions of people. Moreover, no other technology allows to reach so many people from so many different places and so far, neither television nor radio, etc..
Another feature that makes the Internet necessary, is that it allows simultaneous participation of many users. In second place, as many authors (myself included) argue, Web 2.0, which is based on the Internet, is the fundamental structure upon which the crowdsourcing works. Not only enables the creation of platforms, but allows the necessary and correct interaction between individuals. It allows hundreds of users to participate in crowdsourcing initiatives simultaneously and without leaving home. Without Internet, how could people interact and participate in an Idea Jam session?. What do you think? Is Internet necessary? Different opinions? Previous Post:PhD dissertation defended and “doctor” degree achieved. Doctor Estellés-Arolas. Es una duda que me entraba cuando dicen que un programa de TVE es crowdfunding. En televisión también se accede a una masa muy grande de personas. ¿Es esto crowdfunding? En principio, y desde mi punto de vista, no. Se podrán hacer campañas de recogida de dinero, campañas de financiación, recoger dinero a través de SMS… pero no serán crowdfunding. La razón es que el número potencial de personas a las que se puede llegar es mucho menor. Y ahí, en el número potencial de personas a las que se puede llegar, radica parte de la fuerza del crowdsourcing. Imagina que lanzas una campaña en un programa de TV en concreto. Solo las personas que tengan sintonizado ese canal, podrán acceder a la información que se proporciona y podrán (si quieren) participar. En principio, lo más probable es que personas de otros paises no vean ese canal… y ahí estás perdiendo gran parte de esa multitud. En cambio, con Internet, el número potencial de personas que pueden participar es enorme. Cualquier persona de cualquier país puede acceder a tu proyecto… ahora falta que se promocione adecuadamente este proyecto, en los canales apropiados, y que sea accesible al mayor número posible de personas (en inglés y castellano, etc.). P.D. : Gracias por la enhorabuena (por el doctorado). Ha costado, pero ha llegado.